Antiques challenge. It's leg two for Mark Stacey and Thomas Plant as they continue their road trip through the Kent countryside. Mark is trailing behind. 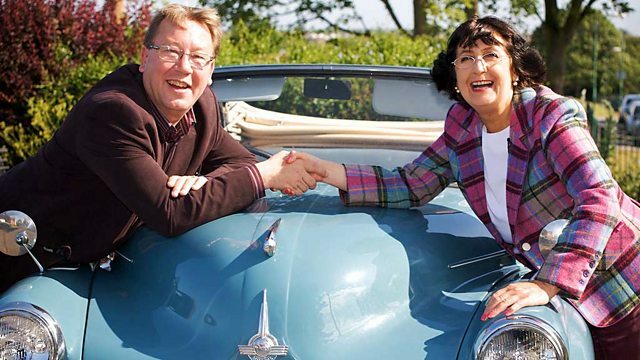 ..with £200 each, a classic car and a goal - to scour Britain for antiques. with auctioneers Mark Stacey and Thomas Plant. -I don't think I'm a Superman. I think you are more like an overweight Lois Lane. -God only knows what that makes you. Oh, they love one another really. Mark is having a go at a spot of clairvoyance. "who's going to make the greatest profit of them all?" Thomas dazzles us with his encyclopaedic knowledge of antiques. This looks like, almost like, a female bottom. Do you know, he's right. the 1978 MGB GT. I had one of those. -It's a she, is it, in your world? -Well, as all cars should be. but I don't know what to call her, actually. but their first auction saw Mark make a big loss on the dreaded cannonball. This leaves him with £107.50 for the second leg. so has a lovely wodge of £194.30. in Paddock Wood, also in Kent. in Britain to have its very own duck pond. -Well done. I could get used to this. -I'm not going to drive you. I might offer you a job as a driver, Tom. I'm not going to be your driver, not on that money you've got to spend. THOMAS CHUCKLES Don't rub it in, Thomas. -Oh, no. Age before beauty. -Did you just say what I thought you said? Well, you know, I've always been told. This is my colleague, Thomas, who is competing against me. -So, we mustn't be too nice to him because he's leading. and have a word. Is that all right? Right, Mark, you got bit of catching up to do today. that might sell for £30 or £40. So, even after commissions and things, there's a sizable profit. Just to start getting me back in the rhythm. Hm, don't worry. I don't think you'll find any in there. "who is going to make the greatest profit of them all?" It won't answer me, of course. And if it did, it'd probably say, "Thomas Plant." Oh, dear. Feeling a bit sorry for yourself? This is rather attractive, actually. There's only one period, date this could have been made. and takes inspiration from the natural world. The ticket price is £28. That seems cheap. Do know what? I think I might be a bit cheeky. I'll go and find Jackie. -Time to talk money, eh? -and I've already found this dish. and this is no word of a lie. -So, put on your caring face for me. -and I shot myself in the foot with a cannonball. -and she's going to tell me to get out of the shop. -I would love to buy it for ten pounds. Ask her what she would be comfortable with. Thank you. What are you doing, Mark? Dealer Wendy is just downstairs. -Mark wants the best price on this. but he is offering ten. -Right. I'll go and see what he says and that really is...? -It's got to have 18. -You're not going to be happy. -And I tried. I really tried. -..it's not a lot of money, is it, really? And she has been very kind to me, actually. -Let's call that sold, all right? And I'll carry on browsing. -I'll take it downstairs for you. -Thanks so much. I do appreciate it. Well, as you can see, I'm firmly sticking to my ten-pound challenge. so I'm already 80% over what I said I wouldn't pay. Still, a good discount from the original £28 ticket price, Mark. Well, I was going to smash some of your profits. -Oh, well, you've already done that. Well, that's kind of true, actually. Time to get delving, Thomas! In a real kitsch sort of way. It's got "foreign" on the base. and they wouldn't necessarily know where. Hm. Beauty is in the eye of the beholder. And it is called a coco de mer. The sea pod from the Seychelles. It's almost like a female bottom, if you can imagine. There's the bottom and the legs, etc. You get them in different sizes. This one has been made into a tray, a cutlery tray with a handle here. It would have all been covered. And it's been designed... And it's a tourist piece. the Seychelles native has been protected by law since 2010. And it's just a lovely piece of natural sculpture. Could be my first purchase of this leg. Thomas is sure this piece is late 19th or early 20th century. Let me see who it belongs to. I just worked out what your necklace is. It's a fox, isn't it, or something? -A little hedgehog. It's sweet, isn't it? Looks like the coco de mer is working its lovey-dovey magic. I'd like to ask if it's possible to buy it for 40. -I haven't got a problem. After a quick call to the dealer, Berryl has a price for Thomas. -Shall I just go and ask him? Would you meet them at 50? Thank you, Barry. Thank you. What a charmer! The first purchase of leg two for Thomas. -The fascinating coco de mer polished nut. Where Memories Meet is Mark's second shop of the day. Joseph is the proprietor here. -Hi, I'm Joseph. How are you? -Nice to meet you, Joseph. I thought I was going to an antique shop. It looks more like a cafe. Yeah, we try to mix it all up, really. or try and look for some china. The antiques are downstairs, Mark. But at least you got a guaranteed cuppa, though. -Got you a cup of tea here. Oh, tea-time. No cake, I noticed. Come on! Get to work. Ha! you can stretch this out. It is a good, decorative thing. I love the carving and I quite like Indian items. I'm not even going to look at the price of that. I'm going to put that as a possibility. which he probably sells more of than sliding book slides. there are purchases to be made amongst the cakes and pots of tea. And look! He has found something else. But it's like a sort of pedestal comport. and then a sort of domed pedestal. A comport is simply a footed bowl or plate. And it has taken Mark's fancy. somebody looking round online will think, "Oh, that looks rather nice. "I'd quite like that for the centre of my table." And they might pay a reasonable sum for it. So actually, that might be a possibility. Sounds like it's about time to talk money to me. Wow. Can see you found a couple of pieces. Well, I have and I've had a jolly good look round. -You've got some fascinating objects. -I'm going to tell you what I'm going to try to achieve. OK. I had a very difficult first auction. I lost quite a lot of money. FEIGNS CRYING: I've heard this story before. But I have found two items, but I've got to be terribly mean with you. so I don't know what they are. -They could we thousands for all I know. for me to get a profit at auction. and the comport is £26. I...I would like to think so, yes. And I think these might help me achieve that. I'm happy to sell them to you at that price. Joseph, you are a star. Certainly in a generous mood. Huh! Two items at less than half price, should help you out there, Mark. -Thank you very much for supporting us. £20 for the book slide and the comport! -Thank you, Joseph. Good luck. Ha! Well done, Mark. You now have three lovely lots. in the glorious village of Penshurst, in Sevenoaks. Thomas is stepping back in time to visit Penshurst Place. This medieval manor house is steeped in royal history. Literally fit for a king, Henry VIII used the estate as a hunting lodge. it's been in the continuous ownership of the Sidney family. But there is one Sidney that holds a dazzling torch in the family history. -How nice to see you, Thomas. where actually are we in Penshurst Place? which was built in 1341. And when did your family move here? Well, we were given it, luckily, by Edward VI. a charismatic Elizabethan courtier and a heroic soldier. and would give many of today's A-list celebs a run for their money. This is the state dining room. These are all sort of the early portraits. but it's actually an 18th-century picture. Philip was born at Penshurst in 1554.
that would shape the rest of his life. as the leading advisor to the Queen on international relations. He just was the Renaissance man. "Even at this distance, Sidney is dazzling." and worked to raise the standards of literature in England. and been likened to the great Bard. they all bring him up as being one of the leading lights. to get back in her good books. an MP at 27 and was knighted at just 29.
he'd always sort of known the Queen held a candle for him. with Sir Francis Drake, a mate, to go to the Americas. and the Queen sent a messenger to get him back. Sir Philip aspired to be a soldier. against the Spanish, paid the ultimate price. Fighting against the Spanish, he met a sticky end, didn't he? and so Sir Philip said that it was a chivalrous act. "If you haven't got yours on, I won't have mine on." And he got a musket ball in the leg. He died six weeks later. But what a brave man to take off his armour. Well, I think it was foolhardy. Oh, probably, yes, but we all think... And how old was he? Oh, that's no age, is it? 32 and he had achieved so much. that he be given a state funeral. The first commoner to be graced with such an honour. So, this is what I was going to show you. It's Sir Philip's funeral helm. It is larger than life-size. And it was probably made at the armoury at Greenwich. He was granted a state funeral. The first commoner to have a state funeral and the next one was Nelson. It must have been a vast expense. a valiant soldier and one of the greatest Elizabethan writers. our lovable duo are reunited once again. Time for a rest before they get going again tomorrow. of our Mark and Thomas. Oh, no. I have not bought a cannonball. You're going to have to buy something spherical. -But I'm with you. You're slightly spherical. I am not at all slightly spherical. Ha-ha! No, you are a fine figure of a man! Let's remind ourselves of their shopping trip so far. but still acquired three items. and the porcelain and gilt comport. He still has £69.50 to spend today. which means he's got £149.30 for the day ahead. in the village of Chart Sutton, in Kent. I'm looking forward to our shared shop. I do like a shared shop. I like annoying you in the shop. -I like you annoying me, Thomas. Fortunately, you are one of those people I can just rise above. -Am I just white noise? They are both shopping in Chart Sutton Antiques. I do hope they behave themselves. -Oh! What are you doing?! I tell you, you're never driving again! -Oh, stop moaning and get in! They should come with a health and safety warning, those two. -So, you're looking for some bargains? -Well, you won't find them in here. No. Let's go, then. Let's go. Off to a good start, chaps. Now, if they could just get along in such close quarters, we'll be fine. There's a lot to choose from here and Mark has spotted something. but this is really nice cos it's modelled as a lady's shoe. At least it's not another lady's bottom. Ha! which is a real shame, actually. Priced up at £20. -I mean, that's quite cheap. Look, he is onto something else now. but I like the inscription. "on the occasion of his marriage, July 18, 1934." That is priced up at £48, which is quite a lot of money. and I like that, actually. the owner of the cigarette box, is also here. I think it is beautifully done and I love the presentation. if we're going to negotiate a price. Yes. Better make this quick then, Mark. I had the most disastrous first auction. I think this could be quite interesting. Of course, I don't want to push you. But I really could do with a little bit of a leg up, if I can. Do you want me to give you some money to take it away? and then you can come back to me, all right? -I'll go down to £40. Oh, no, I can't do it for £40. Could we possibly do it for £30? And I will shake the hand. I think you'd take my hand off as well if we did that. I wouldn't ask if I wasn't so desperate. Don't do it. Stay true. Thomas, concern yourself with your own shopping, please. £32. And you have really, really done well in that. -£32. Thank you, it's very nice of you. Mark has got another generous deal for the very stylish cigarette box. Now, what about that little fruit knife? Can that be terribly, terribly, terribly cheap? It depends what terribly cheap is, really, doesn't it? Starting point I'm going to suggest to you is a fiver. I think if we can say ten pound, I'll have it. Because then I think it might make £20 at auction. -Can we split the difference and do £11? -No, we cannot. Over a pound. ..you know, it is much 'arder for me. -Oh, go on, say a tenner. Cor, more generous deals for Mark. now give him a total of five items. But how is that Thomas getting on? trying to do a deal. Despite the distractions, Thomas soon sniffed something out. That looks quite fun. That is 19th-century. I bet you that is a vest case. So, a match strike. It's just really unusual. Wouldn't mind looking at that. Trevor's services are required once more. It is just this creel here. It is quite sweet that, isn't it? and is priced at eight pounds. -If that's going to be a fiver, that would be fabulous. Well, we could...I'm sure we could do something, Thomas. I'm sure we can do something. That creel is more Mark's budget. But it's dead sweet. It's well-modelled, it's in brass, it's 19th-century. It appeals to two different types of collectors. And fishing is the most popular pastime in this country. Online, it would look brilliant if they photograph it well. -This could be a winner, Thomas. -Can I talk about that creel? -It can be five pounds. -That is a definitely buy. -I'll give you a fiver, if that's all right. Thomas is still lagging behind his rival on the buying stakes. to the historic town of Rochester. I am so looking forward to seeing the castle. I believe it is quite historical. one of the best preserved Norman fortifications in Europe. whether the Crown of England would stand or fall. to find out more about this bloodthirsty tale. -Nice to meet you, Jeremy. to retain power in the country. and harshly exploiting his feudal rights. This bred deep discontent with the ruling barons. They decided to take action. Jeremy, why have we arrived at this part of the castle? the 800th anniversary of the sealing of Magna Carta. in 1215 to make peace between King John and the rebel barons. Amongst the many conditions, it promised access to swift justice. Neither side stood by their commitments. and preventing John getting anywhere near London. King John was determined to hang onto his land and his crown. -John moves very quickly and he is at Rochester within three days. but a large part of them was negotiation. You didn't want to lose men yourself. -..or as little as possible. But John turns up and he attacks. Straightaway? Straightaway. and King John and his men outside trying to blast the walls down. but his siege engines failed to make any impression on this keep. So, he changes his plan. They attempt to undermine a corner of the tower. and replacing stones with wooden pit props. ..of the sort...the least good for eating. So, that is the fattiest of fatty pigs. the barons retreated behind the safety of a second thick wall. But the siege soon came to an end when all provisions ran out. John does actually have to starve them out. -They're reduced to eating their horses. After two months of stallion and chips, the barons surrendered. -What a very splendid view up here, Jeremy. -It is wonderful, isn't it? So...King John has won Rochester Castle back. Things go badly for him after that. contracts dysentery and dies soon after. But curiously, the tide turns back in favour of the Crown. the Magna Carta was reinstated by the rebel barons in 1217.
remains a powerful symbol of liberty around the world. and he has still got a bit to buy. and he has got just over £144 to spend. -God, you've got a lot of stuff in here. -It is loaded, isn't it?! There is certainly a lot to choose from here. Two little Poole pots, hand-painted. These are very Deco, with this dash design to the rim. They are definitely a possible purchase. These little Poole pottery salts date from the 1930s and are a fiver each. but this is real West German Pottery. Looks like lava dripping down a column. but some pieces can command hundreds, even thousands of pounds. This one, though, has a ticket price of £20. Being German, it has got to be efficient. Now, on here is the number 26. Cos it's German, that 26 means it's 26cm high. has its size on it, so you don't have to do it. So, that definitely could be a purchase. And these two little salts. I think it would quite annoy Mark. I just hope it doesn't end in tears. So, this is a walking cane. I think it is probably horn from a goat. Yes, they were used as sort of persuaders, I would say, to pay up. by tyrant landlords as weapons against tardy tenants. I think this is certainly one which would be good. It is of beautiful shape and form. It has got a ticket price of £48, so let the haggling commence. £38. Can it be £28? -I'll let you have it for £30. How's that? -That IS ever so fair, isn't it? What about the Poole salts and the West German vase? -They've got £30 on them, haven't they? And I suppose you want them for next to nothing. Not necessarily, but I want to give you something for them. That is good of you, Thomas. Gosh. -£50 for the lot, you've got a deal. Well, that completes Thomas's shopping. the pair of Poole pottery salts and the 19th-century rent stick. but what a variety of stuff. Mark worked with extreme caution. He also bought five items. and the silver cigarette box, spending a cautious £80. But what do they think of each other's bag of treasures? I love that coco de mer basket. I think it is wonderful, absolutely wonderful. got me worried, because he only paid £45 for it. He's bought a lovely Art Nouveau tray for £18. I think that is a great-looking thing and I really, really like it. He's lost half his money. so if he beats me and he does well, I don't mind. and that's not to buy another cannonball. -That is strange, isn't it? -Did you see any, though, to buy? When you were in the castle, did they mention cannonballs? Oh, you cheeky scamp, Thomas. a rather beautiful setting, fellas. -I'm watching the plant pot. I thought you'd be used to that plant. Great, come on, hurry up. Turn the engine off. -I've announced that I'm here. It is all fun and games for now. Huh! Our auctioneer today is Alexander Jenkins. What does he think of Mark and Thomas's lots? I would rather see it as a whole item and not carved. There is a little bit of damage there. and the vesta I think will catch people. I think people will just like that. I think that is the little winner of the lot. All quiet. The auction is about to begin. First up is Thomas's Fat Lava vase. Ten pounds anywhere? Ten pounds? Six behind you, seven. Eight, nine, ten. Have another one. 20 is here. 22 anywhere? -I take my hat off to you. You made a profit. -Well, I knew it would. Oh, did you? Of course, you did, Thomas. Of course, he did! Good profit to start us off with, though. Next up is Thomas's fascinating carved coco de mer tray. 50 is there. 52 anywhere? Let's just call 60. £60, 70. 110 I have got here. 120, 130. Come on, now, stop pursing your lips. Get that bid out. 160? 170, it is going. Last chance. -Thank you. Yeah, it's pulled well. Thomas has quite the lead now. It is Mark's first lot of the day, the carved book slide. Start it off at 30. £30 for it, £30 for the book slide. Quite right too. -£30 has tripled my money, anyway. -Do you know, that is not a bad price. Thank you so much, Joseph. I am so pleased I went to that cafe. At last, all smiles from Mark. Good return under on your ten-pound spend. Back to Thomas. It is the 19th-century rent stick next. £20 for it. Come along, 20. £20 anywhere? 20 I've got, thank you. 22 anywhere. Should be. 22 anywhere? At 20 I sell, then. -£20, lost ten pounds on it. Thomas's first loss. But he is still out in front. another one of his tenner buys. Starts off here with me at £20. -Oh, my God. You've doubled your money. £22 anywhere? 22? £20 I have. 22? -I doubled my money, Thomas. He's happy with that. Your tenner tactic is working so far. with the slightly dearer £18 silver-plated Art Nouveau tray. And we have auctioneer Paul at the rostrum now. Start me at 20. £20. Ten pounds, then. Silver plate. Ten I'm bid at the back, 12 I'm bid, 14. 16, 18 at the back, 20 online if you want. -That's a little bit of a shame. -It should be £30, shouldn't it? -I am...feel a bit let down. -I thought that might do a bit better. Hey, it is still a profit, Mark. Next up are Thomas's Poole pottery salts. Eight pounds. Anyone at eight pounds? Start me at five pounds, I'm bid. Six anywhere else? Five pounds. One bid takes it at five pounds. Seven pounds I'm bid on my left. All done at seven pounds. That's really good, Tom. It was well worth spending a fiver. -It is well worth doing that, isn't it? Well done. It paid off. A small profit for Thomas there. Can Mark's elegant little fruit knife help him catch his rival? £20 for the fruit knife. Got to have 20. Ten pounds is there, 12. Small, incy-wincy profit. Those low punches, back in the ring again. But still not getting anywhere. Come on, Mark! You've doubled your money with that little knife. It's Thomas's fishing creel vesta box next. £30. 30 online, is there 32? 32. I knew you were waiting, sir. 34. Online if you want. 36. 36 I'm bid. 36, 38? 38, 40 online if you want. 40, 42. 42 I'm bid, 44? At £42. One more, 1040, if you want. -That is a good price. At £44, last time at 44. -I think that is brilliant. -It deserved to make that money. -And a bit more. I wouldn't have been surprised. built on a five-pound stake. the elegant silver cigarette box. £100 for the silver box. Anyone at £100? Silver box there for £80. Start me at 50, then. Anyone at £50? I'm bid. 55, 60, 65. -Well, there we are, Thomas. That was my last chance. Well, I made £33 on it, which is good. Thank goodness for that. Great profit. Who will be the jubilant winner of the second leg? Let's work out the maths. Mark started this leg with £107.50. so Mark's grand total for next time is £171. carrying £309.96 into the next leg. Well, you have done it again, Mr Plant. Well done. I will drive you because you've been successful, as well as I have. -I feel you need your energy. I do need my energy. I need more than that, I need a drink. Bye-bye, chaps. See you next time. This has always been my problem. I am too generous. Yeah, that works, so maybe I'll be able to call Mark. It's leg two for Mark Stacey and Thomas Plant as they continue their road trip through the Kent countryside. Mark is trailing behind, but can he catch Thomas when they head to an auction in Paddock Wood?